It’s time for more tool battery teardowns! 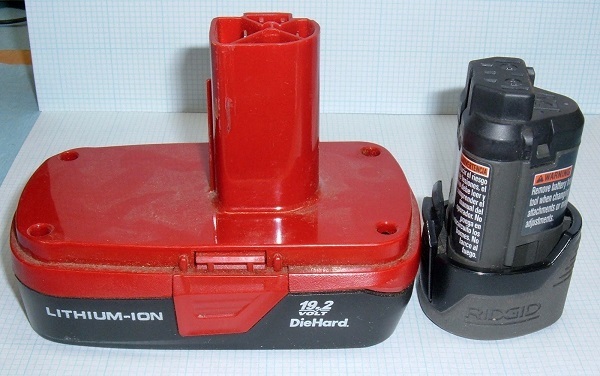 This week, I’ve got a Craftsman 19.2V DieHard battery, and a cute little Ridgid 12V battery. They’re both lithium, and I’m going to dig into both of them, because that’s what I do with old batteries I pick up out of junk bins. If you’re bored of tool battery teardowns, you could always send me more interesting things to mess with! I enjoy poking around tool batteries, and a lot of the ones I pull apart are “new to the internet” in that they haven’t had a detailed teardown before. It’s always interesting to see how different companies approach much the same problem. More details on Syonyk’s Project blog.